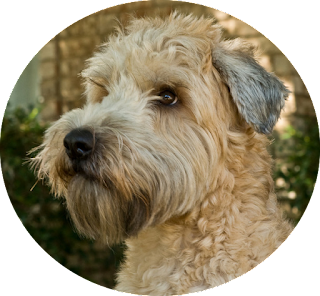 I have a Soft Coated Wheaten Terrier named Peanut Butter: we call her Peefee for short. Over the last nine years, she’s become more human than dog. We talk to her and believe she understands our language, we assume she can speak to us, we even convince ourselves that “she just wants to be with us” when we’re sitting around, despite the steak on our plates. After all, Peefee would never be so shallow as to spend time around us because of what we can give her—she’s way too sensitive for that. She’s often the first one to greet me when I walk in the door; always brimming with exuberance and excitement. Irrespective of any doubts I may have about her actions or emotions any other time, I know for a fact she is excited to see me at the door. I think the fact she can express honest emotion at one point only makes the times she reacts out of selfishness that much more difficult to discern. After all, if she can greet me with happiness and excitement at the door, couldn’t that mean she really only wants to be with me, even when I’m eating steak? I end up using my own need as a filter for my perceptions of her intent. Yesterday, Peefee was super excited…her tail was wagging ferociously; but, because she was sitting, you couldn’t see it—all you could see was her bottom jiggling back and forth: no tail; all jiggle. How much are we like my dog? When we’re around other people, do we give them enough to believe we’re being genuine, even though our motives are not? Have we invested just enough in other people that they invite us into their confidence because they choose to believe the best of us—or because we’re always genuine? Or perhaps we are the ones that have real exuberant joy, but no one sees it because we’re sitting on our wag? I believe we all need a class in Peefeeology. Thanks to my wife Mary for this post idea and for every day we’ve been together…you my dear are my treasure.